This is not the first time this has been revived in the Philippines. 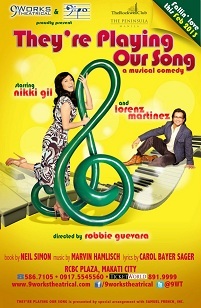 According to some online sources, Lea Salonga and Adrian Pang already performed this musical back in 2000, although it was a Singaporean production. In any case, it seems many people love it because now they are reviving it again. There really is nothing special with the story. If anything, it is actually just the typical rom-com fare following that template where the girl is upbeat, the guy is aloof, and they get into a fairly complicated relationship, then break up, and end up together again. Come to think of it, most of the movies churned out by the mainstream are of this kind, but people never really get tired of it. It is perhaps because this is a common experience shared by many in their lives, and watching it either onscreen or onstage would always trigger something in you that leads you to a familiar place. Nikki Gil as Sonia is perfect casting. This character shares many similarities with her role in Sweet Charity. If not for the wig and the name change, you would probably think that you are watching the same character. This is not bad at all because she is good in playing this kind of role. When she is cheerful onstage, it transcends the fourth wall and makes it through to the audience. When she tears up while singing I Still Believe in Love, you cannot help but feel for her. She is undeniably a sweetheart, but here is hoping that she gets to do something different the next time she goes up the stage. Or maybe we should just be happy seeing her do something light onstage and leave the heavy roles on TV, where she also exceeds (Apoy sa Dagat, anyone?). Either way, not every theater fan would go out of their way to turn the TV on every night, and it is safe to say that it is also true the other way around. So yeah. Variety, maybe. Lorenz Martinez sings very well and has presented a pretty good male rendition of Fallin’ which one would think to be a disaster if sung by a guy. He is also a good actor but there is just that one mannerism of him, perhaps the way he delivers his lines, that is almost always present when he hits the stage. Otherwise, his past performances in You’re a Good Man, Charlie Brown and The 25th Annual Putnam County Spelling Bee would not have been involuntarily conjured in my mind while watching this show. That is not particularly bad, especially if you are not a frequent theatergoer, but for someone who is, you would probably notice it too. Nonetheless, kudos for the highly entertaining performance and the great comedic timing. Those punch lines would have fizzled if done any other way. Ah, yes, the witty banter! You would love how the dialogue is funny not just because it makes fun of the situation the characters are in, but because they are also well-crafted to allude to several the other relevant themes such as music. The Leon character is also utilized well as a plot device. Although he does not really appear in the play, he is consistently referred to as responsible for the many flashpoints in the two main characters’ simmering love affair. In a way, he is a good symbolism of the past that would not die, personified but kept invisible to ironically create both tension and the very resolution to such which paves the way for a happy ending. Aside from the pair of trios that serve as the manifestation of the two’s inner selves, Leon is a part of the cast who is just as worthy of recognition, even if he does not appear at all.